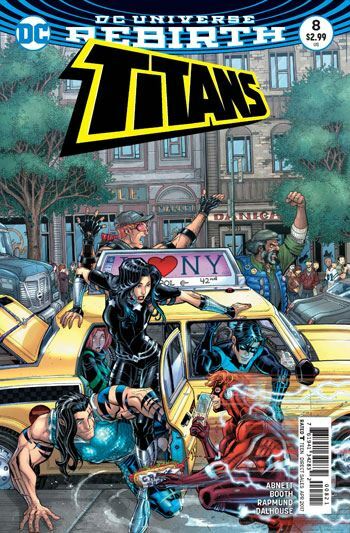 Bumblebee is back in action, but that is not exactly good news in the latest issue of Titans, by Dan Abnett and Brett Booth. Karen Beecher is at the core of the story, along with Mal Duncan, but there is development on the other Titans as well. In a nice touch, Donna Troy seems to be resuming her career as a photographer. I really don’t recall the last time that was used in a story, but it was such a big part of her life way back in New Teen Titans. The plot thread is introduced in relation to once again exploring her mysterious and ever changing past, and I hope Abnett does not drop this once he answers the eternal question, who is Donna Troy? Wally West tries to arrange a date with Linda Park, but she is busy. Wally discusses this with Nightwing, as well as his feelings about not really having any sort of life outside the Titans in this reborn world. The training scene, with Garth and Lilith, is probably the least emotionally engaging of the sequences with the different Titans, but did make me laugh out loud. But as I said, the main thrust of this issue deals with Karen and Mal. Mal’s past as Herald, and his powers, were used in Titans Hunt, but in this story it seems that Karen’s career as Bumblebee has been erased from continuity. Or had been, as she is now working on developing her powers. Mal brings her to Meta Solutions, and introduces her to P. Simon. I’m not even trying to conceal who this really is, and there are enough hints along the way for any experienced Titans reader, so that the final revelation scene is more of a payoff than a surprise. But that’s fine. It’s still a fun story, with a lot of good moments. And I have always had a soft spot for Bumblebee. I’m old enough to remember her introduction to the Titans, when she just tossed together an outfit that allowed her to fly and shoot darts out of her bum, in order to show Mal that the Teen Titans didn’t care about him. She was wrong then. And this time around, it’s Mal who has made the big mistake.